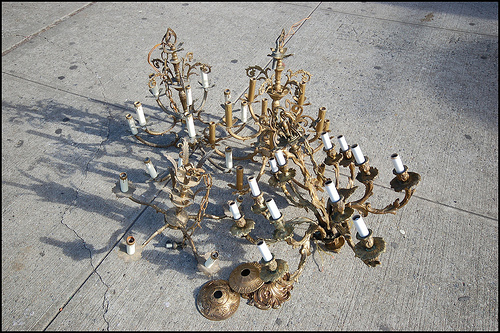 For over 35 years, the Lamp Doctor has been restoring and designing lamps and lighting fixtures on Coney Island Avenue in Brooklyn, NY. Over that time, we have accumulated a fair amount of praise for our services. Below, we have collected just a few of the recommendations of our fans. "When you step into the Lamp Doctor, it's like stepping back in time and you're back in the early 1900's. Peter is very creative, a fantastic craftsman with lamps. I brought in my grandmother's antique sewing machine and Peter's eyes just lit up. The sewing machine was mounted on a beautiful base and fitted with an oblong fringed shade. It is now sitting in my study at home and will always remind me of my grandmother. It's the centerpiece of my room." "I get all old antiques and bring them to [the Lamp Doctor] and they clean them up and repair them and it's perfect!" "I bring all my lamps to the Lamp Doctor to fit lampshades. Somehow the right shades make the lamps even more beautiful! They take the time to expertly shade my lamps, that's why I keep coming back." "I collect vintage and antique sconces which usually are in a total state of disrepair. The Lamp Doctor rewires them for safety and will restore them to the original finish. I just love the transformation!" 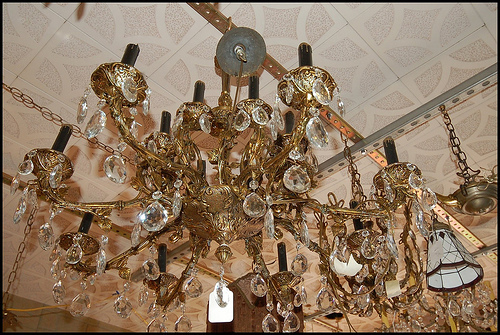 "The Lamp Doctor saved my inherited chandelier from ending up in the garbage. They cleaned my crystal chandelier inside and out, fixed the broken arm, and hung the crystals. It went from an unusable broken and dirty chandelier to the centerpiece of my dining room. Thanks, Peter!" 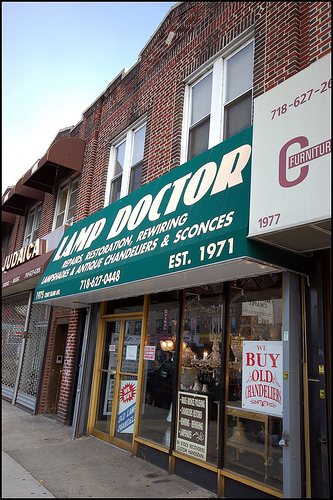 "Try the Lamp Doctor at 1944 Coney Island Avenue 718-627-0448. They have rewired a number of fixtures for me and my sister, including a very complicated chandelier from Iran and a pair of 19 c. sconces. Reasonable prices and very quick service. Lots of experience with antique pieces. Fun junky storefront." "I'm restoring a lovely brownstone in Park Slope and over the course of two years have brought many fixtures to the Lamp Doctor to be restored, as well as my original hardware to be polished. They take a genuine interest in my fixtures and rewire and restore them as if they were their own. Their suggestions for restoring the different finishes have been extremely helpful. My chandeliers and sconces look perfect for my rooms when rehung. Thanks Peter and Carol for your expertise!"